The last day of filming went about as well as the second day. 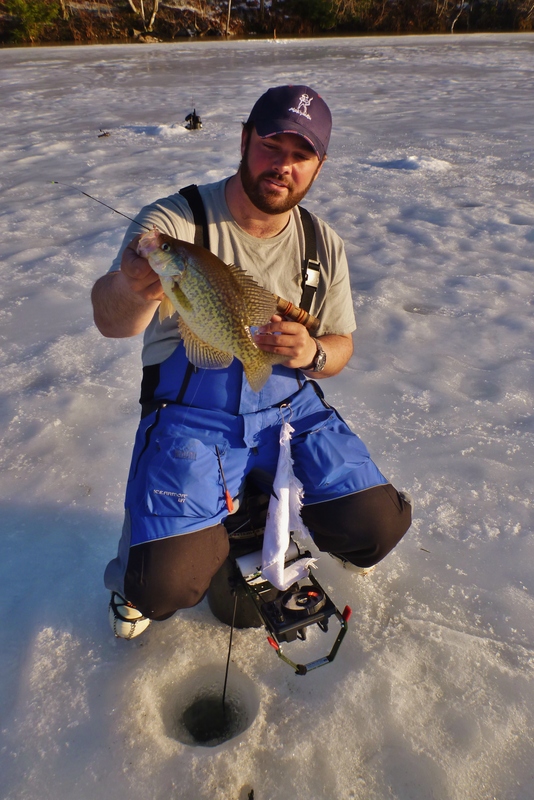 We ditched Lake Champlain and headed elsewhere hoping for some whites. I got there before the rest of the crew and started fishing. I cut a bunch of holes and right off got into the bluegill. The size was decent but not great for the body of water we were on. Our tip ups did nothing excepts for soak. After a few hours of nothing but bluegill we thought that we might be able to find better fish elsewhere so we headed out. The shores getting on were rough. I had to wade through about a foot and a half of water just to make it on the ice. Once I was, it things were fine though. As I arrived to the first location, I fished some holes that were already open. 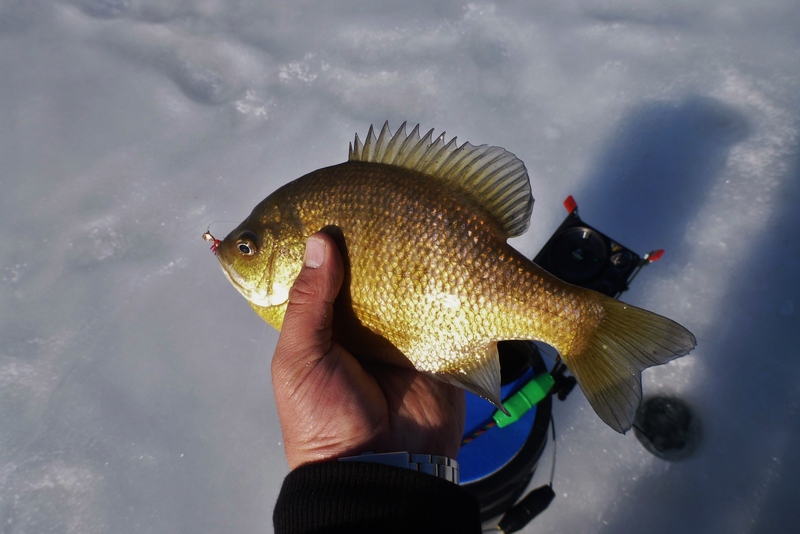 Picking around, I found some crappie and bluegill. We managed to get a few fish on camera but the bite wasn’t consistent. As the sun started to set and we lost camera light, the fish turned on. 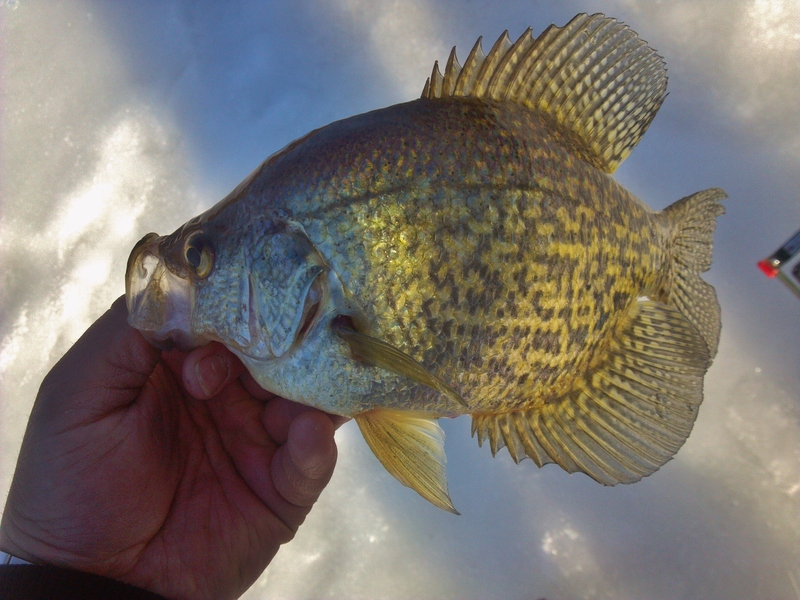 Crappie were all around and some nice gills as well! The best part of the day was fishing in a t-shirt until the sun set! It sure didn’t feel like a January day! Do you tip the jigs with live bait? That’s a nice sized bluegill. At times it helps. Sometimes is makes no difference.